VietNamNet Bridge - The rapid development of shrimp farming has contributed to serious environment pollution and mangrove forest devastation. The big profits that farmers can expect explains why shrimp farming has been developing so rapidly in recent years. According to Vo Hong Ngoan, who is known as the “Shrimp King’ of the Mekong River Delta, shrimp farming can bring very high profit: one dong can bring 2-2.5 dong. In Bac Lieu province, for example, farmers can get VND300-400 million worth of profit for every hectare of water surface used for industrial shrimp farming, which is dozens of times higher than rice tilling. 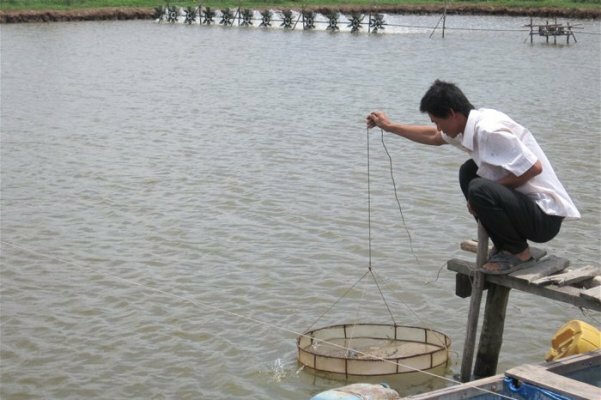 According to the Ministry of Agriculture and Rural Development, Vietnam had 500,000 hectares of brackish shrimp areas in 2005, while the figure increased to 600,000 hectares. This means that 10,000 hectares of new shrimp ponds appear every year. In order to expand the cultivation areas, farmers have shifted from extensive farming into industrial farming which allows them to get a higher yield on the same cultivation area and seek higher profit. As a result, the environment has been harmed seriously. According to Truong Quoc Phu from Can Tho University, with the industrial farming model, shrimp is bred in high density and fed a great deal. This has created more waste, thus leading to pollution and an epidemic outbreak. “Farmers discharge water from their shrimp ponds to the environment without any treatment. As a shrimp hatchery develops uncontrolled the waste water from these shrimp ponds is pumped into other ponds. As a result, the water gets polluted,” Phu said. The rapid development of shrimp farming has contributed to serious environment pollution and mangrove forest devastation. Farmers tend to use more antibiotics for shrimp to prevent diseases as pollution is worse. However, this medicine abuse has made the situation worse. Experts have also rung the alarm bell about the disappearance of mangrove forests in many localities in Mekong River Delta in recent years. The fat profit from shrimp farming has prompted farmers to devastate forests to find sites for shrimp ponds. “Forests help treat the waste and ease pollution. As the forests are devastated, the machine that helps filter the air and water won’t exist anymore,” he explained. Phu from Can Tho University has asked for a reasonable strategy for shrimp farming development, or Vietnam will have to pay a heavy price for the industry.